Play regular or 3D DVDs using HDMI - no additional audio equipment required. Project MPEG4 files from a USB drive. Present in 360 degrees, even in small spaces. Remove distractions and you can improve learning, right? Mount the PJ X4241N on the ceiling so it's out of the way of children of all ages. Or, place it at the front edge of the table as close as two feet from the wall - because it's a short throw projector, you can still get the full picture even in smaller spaces. And because you aren't standing between the light source and the screen, there are no shadows or glare. Turn your plain whiteboard into a digital whiteboard with the optional interactive tool kit. You can easily write, draw, save and share what's on the board with the class. Work smarter and save time by not having to transfer information from the board to paper. Do something unexpected to spice up a lesson or get the attention of your class - project images or information on the ceiling or floor. Keystone correction automatically fixes any image distortion. 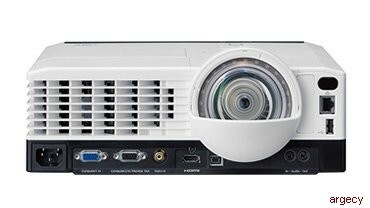 50" - 400"/23.2" - 200"
Overall mean values for product at time of shipping are indicated in accordance with the JIS X6911-2003 data projector specification format. Preset to this range of supported signals. Signals not present by display even if they are within this range. When using the USB terminal for computer-free presentations, there is no guarantee images will display. They may not display because of the file. 4 Not supported on 64-bit version. Warranty: The Ricoh PJ Series is under warranty against defects for a period of three years from the date of purchase. Consumables are under warranty for a period of 90 days from the date of purchase or until depleted, whichever comes first. Please refer to warranty documents shipped with the product for more details. For maximum performance and yield, we recommend using genuine Ricoh parts and consumables. The Ricoh PJ Series is under limited warranty against defects in material and workmanship for a period of 3 years from the date of purchase. Consumables are under warranty for a period of 90 days from the date of purchase or until depleted, whichever comes first. Please refer to warranty documents shipped with the product for more details. For maximum performance and yield, we recommend using genuine Ricoh parts and consumables.